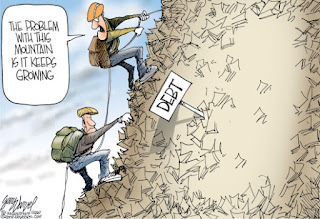 Debt is like a mountain. In the early days the gradient is gentle, but the more money a person owes, the steeper the slope becomes until that person stops, exhausted and sick of climbing. Taking stock of the situation, our climber will feel like he’s trying to walk up-hill while carrying a Mule on his back. Thinking about his dilemma and aching muscles, he might start wondering why isn’t the Mule carrying him? That’s the fundamental question: why does money work against us, instead of helping us to move forward in life? The answer to that question is, the money you’ve acquired is someone else’s. You have to pay it back with interest. Before you’ve even spent the money, you’re already required to payback more than you borrowed. Continued borrowing leads you straight up that hill. Next question: what are you going to do to get out of this vicious cycle? To understand why your finances are out of whack, you need to understand three things: how much you need to live, how much you’re earning and what exactly are you spending it on. This process is about financial sobriety. How much you earn is simple and quick: check you pay slips, or your employment contract. How much you need to live on is a little more involved and requires you to make a list of every aspect of your financial life. From Hosiery to housing to haircuts; what does it cost you? It’s likely that the figures for what you earn and what you need to earn don’t match. This is where understanding what you spend your money on is vital. Log your purchases for three consecutive months. Whether you decide to do it using a smartphone app, or simple pencil and paper, go with whatever makes you comfortable. Write down every single purchase you make, the time and date on which it was made and the cost of the item. If you’re buying multiple items, take the receipt with you and log them when you get home. After just a few weeks you’ll begin to recognize any destructive spending patterns you’re in. At this point, you can begin to change. If these steps have made you reassess your spending, it’s likely that you’re also considering how you spend your time. People who misspend their money often misspend their time too. Think about how much time you put in to making money; probably just 9-5, which for some people is enough. It could be enough for you too, if you weren’t spending more than you can afford to pay back. What you have to do now is spend your time making the money you need to bring down your debt. You could do this in a variety of ways: work longer hours; get a better paid job; sell all the unwanted, or unused items in your home; set up a secondary business that utilises something you’re really good at – this is a great one because doing something you really love and getting paid for it boosts self esteem. You could participate in a clinical trial – volunteers participating in a long trial (usually two weeks), can earn up to £2000, or $2500 per trial. Ignoring debt only makes it bigger. The only way to make debt go away is to pay it back. Once you have gained some financial sobriety and started making enough to live on, the extra money you make should be ploughed in to debt. With some effort, that mountain will start feeling like a mole hill in just a few months. Getting out of debt can be a challenge many people struggle to overcome. Knowing useful tips to make the struggle easier is always helpful. This is very true. One reason many people fail is because they don't know where to begin. Eliminating debt is an age old problem that always seems to crop up. It's one people need to face head on if they are going to do anything about it.